I have a dishwasher…but it doesn’t work. SUCH A TEASE! This is my new favorite salad in all the evers. A little spice, a little peanut sauce and SOBA NOODLES? I <3 them. Pinned! My husband has been asking me to make a spicy peanut butter sauce now for years and I’ve never thought I’d be able to….and bam…this pops up!! Sesame sauce, peanut butter (but it’s gotta be Peter Pan for me) and garlic….you cannot go wrong. Like how I can substitute the basil for cilantro (not a cilantro fan I’m sorry to say) because you need that poppin’ green on top for the color. And anything with colored peppers……. Yes! This is great in the summer with those huge fresh basil leaves. Also try the purple thai basil. Excellent flavor, works well with the peanut taste. We live sans dishwasher because our flat is too small for one. I wish we had one though. This salad looks amaze-balls! I haven’t had soba noodles in ages. Dishwashers are dead easy to install. Knock out a cabinet near the sink, install dishwasher. The plumbing is laughably simple. Just go for it! Mmm, I love sauces like that! I make a similar one and put it on spaghetti squash when I’m trying to be good. But I’m totally craving noodles now. A dishwasher? What’s that? We haven’t had a dishwasher in about 2 years. I reaaalllly do miss it though. Dishes pile up quickly and they always take forever to do. This spicy peanut soba noodle salad looks amazing! Gotta give it a try. Gosh I once had to replace my hot water heater. So for a few days not only did not have access to hot shower (beside at the gym once a day) but I had to wash dishes by hand with kettle boiled water. I feel your pain! These look insanely delicious for a lunch time feast. Look into free standing/rolling dishwashers….have had two at two different times in my life. The last time when I bought a 1918 era duplex with very little counter space and no dishwasher…it’s a win-win situation…you get a full size dishwasher and movable couner space. This is all sorts of YUM. OMG. I neeeeed this in my life. 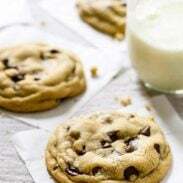 Your recipes are so great – easy to follow, crowd-pleasing, and fun. And you’re probably one of the few blogs that I read all the context before skipping down to the recipe. Too funny! We made a few mistakes when buying our first houses. Our last house didn’t have a mailbox. Yeah, we moved in and watched the mailman drive by and never stop. Doh. In our current house, since it’s old, it has a water pump to regulate pressure. Super noisy. Next time I buy a house, I will turn on the sink and listen for a noise! it might sound crazy but i have a dish washer at my apartment but i havent used it even once…i dont know but i prefer to hand wash it. i do run it every now and then just to clean it up. this peanut chicken soba is right up my alley..i cant get enough! I don’t know what I would do without a dishwasher. Yet, I wash so many things by hand too. 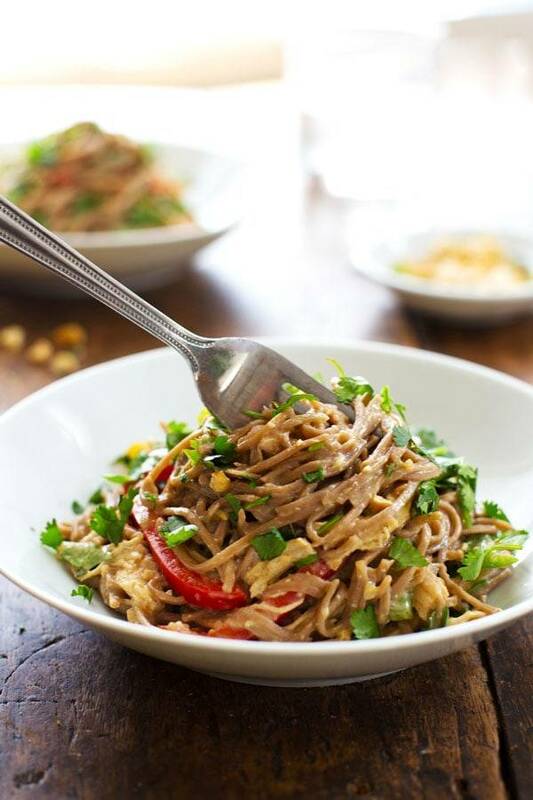 Love this noodle salad with homemade peanut sauce. I am such a wimp – with the amount of dishes our family goes through, I would go crazy without a dishwasher! This dish looks amazing – I love quick and easy dishes that make a ton of food. And you can’t go wrong with chicken, soba noodles and peanut sauce! I spent the majority of my adult life without a dishwasher. Just moved into an apartment with one about a year ago….my life was pretty much changed forever! Soba noodles + peanut sauce is one of my most favorite go-to weeknight dinner! I have actually never tried soba noodles but have always wanted to! Where can you find them? I was so surprised to find them at my regular grocery store, which just has a tiny little Asian foods section. They only had one brand, but they had them! 🙂 Yum! They look to me like spaghetti. Not translucent though, those are usually rice noodles! I just moved into an apartment with a dishwasher for the first time in years, but I’m so used to living without one, that I’m just not patient enough for it! I always have to use something again before there are enough dishes to do a load. So I’ve actually just been using it as a really big drying rack – is that weird? On another note, this recipe speaks to me. I need it in my life, like now. so sad about your dishwasher situation…i know the feeling since i have been married for almost ten years and have never had one either, so i totally feel your pain. i laughed at your emergency voice announcement about it, though! 🙂 good thing you have a positive outlook and you are an awesome cook, so that makes things seem so much better! Oh my gosh – 10 years is a long time to live without a dishwasher! you rock! This looks really good and it looks like something my husband would eat, which is a definite plus! I’m not sure if I missed it, but what kind of vinegar do you use in the peanut sauce? Rice Wine? That is too funny about buying the house and not realizing it didn’t have a dishwasher, at least that is something you can always add later! We lived for about 3 years with no dishwasher and then we finally got one installed in our last apartment and I managed to break it in about 3 days, a month later our landlord finally fixed it and then I broke it again… We recently bought a house and we finally got a dishwasher that isn’t broken, but I still end up washing most dishes by hand because I’m convinced that I do a much better job than the dishwasher does, I do like to use it as a place to hide dirty dishes though! WOW-this looks SO Good! Totally feel for you about not having a dish-washer, and you made me laugh when you said you guys didn’t check, I wouldn’t have thought to check either! I definitely pinned this recipe to make because I’ve been looking for a good spicy peanut chicken recipe to try! I remember being 8 years old and washing the dishes at my grandmother’s house. I hated washing dishes so much that I told her I would save my allowance to BUY her one so I didn’t have to do the dishes when I came to visit. Cheeky. Do you have plans to install a dishwasher at some point? I kind of wish I had not eaten lunch before I checked your blog. Spicy Peanut Chicken sounds so freaking yum! This looks absolutely incredible. Like, drop everything, jump into the car and head to the grocery store to get all of the ingredients, incredible. Our dishwasher died right after Christmas. We have to rip up half the kitchen to get it out so we are hand washing for now. Arg!! For me laundry is worse but dish washing is the close second. I feel your pain with the no dishwasher, but I also have no refrigerator in my kitchen. Seriously. We’re in the basement of a historic museum and instead of a refrigerator, we have an enormous fire sprinkler system for the whole house. I have to make several trips to my laundry room which houses the refrigerator.